Stay at this centrally located Ipswich motel, within walking distance of hospitals, show grounds, the University of Queensland Ipswich and the city centre. Set in peaceful surroundings with delightful sub-tropical gardens, it is only a 15 minute drive to Willowbank Raceway and Amberley Air Force Base. Enjoy fresh, spotlessly clean motel rooms, self-catering apartments, and friendly hospitality. Choose from executive rooms, self-catering one or two bedroom family apartments, or three-bedroom self-contained cottages. All suites are luxurious, large and airy. The fresh, comfortable interiors have been renovated several times, and the road-facing windows have all been double-glazed so that traffic noise, once a problem, is an issue no more. Guest facilities include a barbecue area, swimming pool, high-speed wireless Internet access, reverse cycle air-conditioning, Foxtel cable channels. It is an excellent venue for small events. There is an excellent restaurant and piano bar on-site. 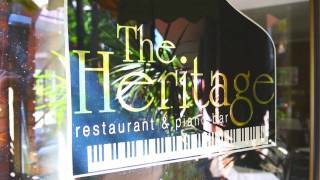 The Heritage Restaurant and Piano Bar has an extensive menu and caters for most tastes. The meals are traditional fare, featuring old favourites like potato and leek soup, oysters kilpatrick, rib-eye steaks, chicken parmigiana, sticky date pudding to name just a few. There are two freestanding three-bedroom houses on the property grounds. Each house contains a full kitchen, three bedrooms, open plan living/dining areas, and each has been refurbished and modernised within the last few years. The standard rooms are well-appointed and comfortable, having all been renovated within the last few years, and contain a queen bed and a single bed. Double-glazed windows insulate them from traffic noise. They contain a flat screen LCD television, a desk and chairs, a small refrigerator as well as tea and coffee making facilities. There is also a hairdryer. The rooms feature good quality carpet underfoot, and there are full blockout curtains to keep the sun at bay in the mornings, and reverse-cycle split-system air conditioning to keep the temperature at your desired level. All Standard rooms are on the first (upper) floor. Superior Queen rooms feature a queen bed, a two-seater sofa and a dining setting for two. There is a large (40 inch) LCD television. Double glazing is unnecessary because the rooms are well away from the road. These rooms contain the same facilities (tea and coffee making, refrigerator, air conditioning, hair dryer) as the standard rooms. All Superior Rooms Queen are on the first (upper) floor. Each of these rooms has a kitchenette with two-burner cooktop, microwave oven, refrigerator, cutlery and crockery. There is a separate bedroom containing a queen bed. The open plan living/dining area contains comfortable furnishings and a large (40 inch) LCD television.